2073S Steel-Sportster 2073- Rear sprocket 1986-1992. 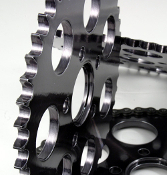 Our Products >> Steel Rear Sprockets, USA >> 2073S Steel Flat H/D Rear Sprocket, Made in USA. 2073S- Steel Rear sprocket, Sportster 1986-1992. Also fits Buell to 1993. Fits 2000 and newer large bearing hubs (belt drive models) with our addition of the double sided center hole, see pictures. Center hole diameter 1.985 in. from one side and 2.214 in from the other. Bolt hole circle diameter is 3.250 with five bolt holes at 15/32 in. each. Available in 45 to 56 tooth sizes. 530 Chain. Finished in black zinc or silver zinc with round lightening holes. Made in USA.. Note: Late model chain conversion models with some mag wheels have a longer hub at center hole, will require 2.214 center hole only. *Finished in black or silver zinc. Zinc plating color finish option? * Select Silver Zinc finish steel with 1.985 center hole. Silver Zinc finish steel with 2.214 center hole. Black Zinc finish steel with 1.985 & 2.214 center hole. Black Zinc finish steel with 2.214 center hole.